The dramatic and enduring design of the OMEGA Constellation is characterised by its famous half-moons, 'claws' on the case and mono-rang bracelet.This 28 mm 18K Sedna gold and stainless steel model features a bezel engraved with Roman numerals, white mother-of-pearl dial with diamond hour markers and scratch-resistant sapphire crystal. The hands, OMEGA logo, Constellation star and diamond holders are also in 18K Sedna gold.At the heart of this timepiece is the OMEGA Calibre 4061, while the caseback is stamped with the Constellation Observatory medallion. 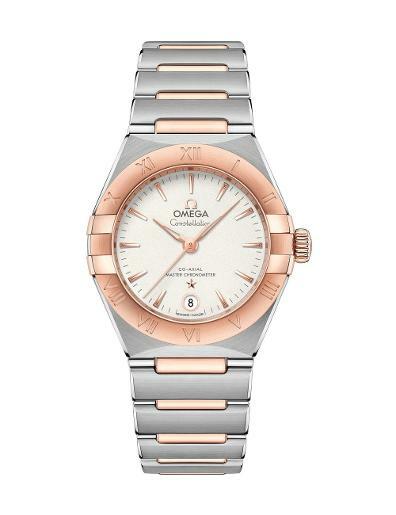 The dramatic and enduring design of the OMEGA Constellation is characterised by its famous half-moons, 'claws' on the case and mono-rang bracelet.This 25 mm 18K Sedna gold and stainless steel model features a bezel engraved with Roman numerals, white mother-of-pearl dial with diamond hour markers and scratch-resistant sapphire crystal. The hands, OMEGA logo, Constellation star and diamond holders are also in 18K Sedna gold.At the heart of this timepiece is the OMEGA Calibre 4061, while the caseback is stamped with the Constellation Observatory medallion. The dramatic and enduring design of the OMEGA Constellation is characterised by its famous half-moons, “claws” on the case and mono-rang bracelet. This 29 mm 18K Sedna™ gold and stainless steel model features a bezel engraved with Roman numerals, crystal white silvery dial and a date window at the 6 o'clock position. 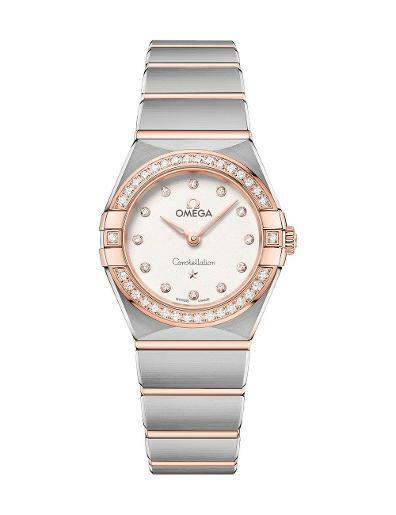 The hands, OMEGA logo, Constellation star and indexes are also in 18K Sedna™ gold. At the heart of this timepiece is the OMEGA Co-Axial Master Chronometer Calibre 8700, visible through the domed scratch-resistant sapphire crystal. The dramatic and enduring design of the OMEGA Constellation is characterised by its famous half-moons, “claws” on the case and mono-rang bracelet. This 28 mm 18K yellow gold and stainless steel model features a bezel engraved with Roman numerals, white mother-of-pearl dial and scratch-resistant sapphire crystal. The hands, OMEGA logo, Constellation star and indexes are also in 18K yellow gold. At the heart of this timepiece is the OMEGA Calibre 4061, while the caseback is stamped with the Constellation Observatory medallion. The dramatic and enduring design of the OMEGA Constellation is characterised by its famous half-moons, “claws” on the case and mono-rang bracelet. This 28 mm stainless steel model features a bezel engraved with Roman numerals, white mother-of-pearl dial with diamond hour markers and scratch-resistant sapphire crystal. 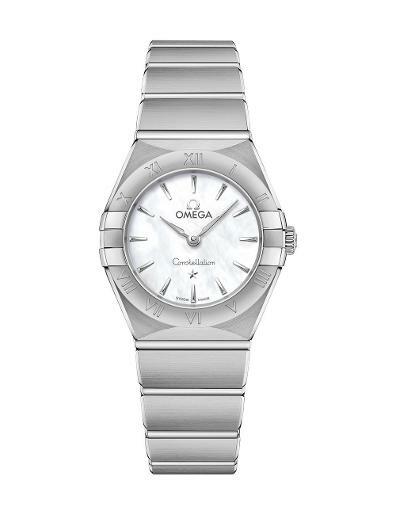 The hands, OMEGA logo, Constellation star and diamond holders are in 18K white gold. At the heart of this timepiece is the OMEGA Calibre 4061, while the caseback is stamped with the Constellation Observatory medallion. The dramatic and enduring design of the OMEGA Constellation is characterised by its famous half-moons, “claws” on the case and mono-rang bracelet. This 28 mm 18K yellow gold and stainless steel model features a bezel engraved with Roman numerals, white mother-of-pearl dial with diamond hour markers and scratch-resistant sapphire crystal. 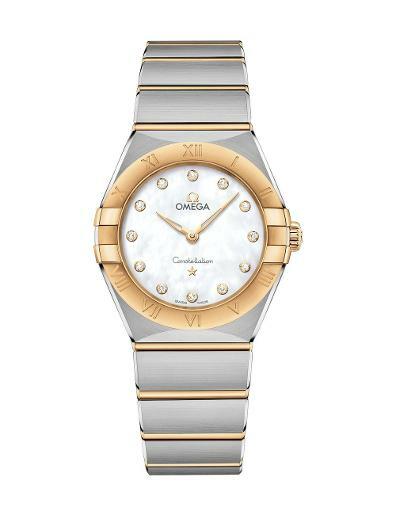 The hands, OMEGA logo, Constellation star and diamond holders are also in 18K yellow gold. At the heart of this timepiece is the OMEGA Calibre 4061, while the caseback is stamped with the Constellation Observatory medallion. The dramatic and enduring design of the OMEGA Constellation is characterised by its famous half-moons, “claws” on the case and mono-rang bracelet. 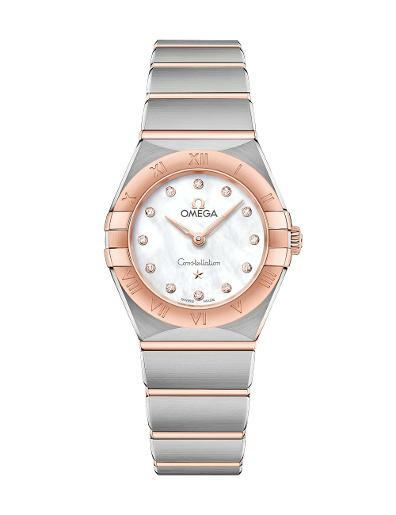 This 29 mm stainless steel model features a diamond-paved bezel, pearled mother-of-pearl dial with diamond hour markers and a date window at the 6 o'clock position. 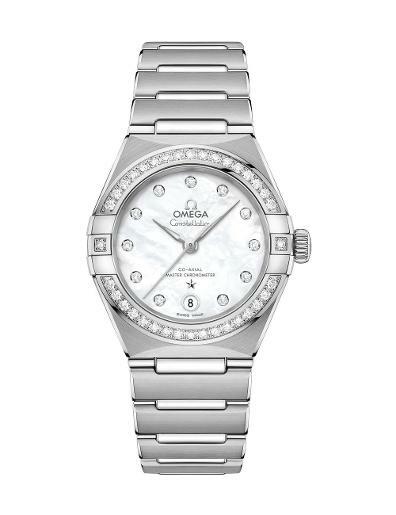 The hands, OMEGA logo, Constellation star and diamond holders are in 18K white gold. At the heart of this timepiece is the OMEGA Co-Axial Master Chronometer Calibre 8700, visible through the domed scratch-resistant sapphire crystal. The dramatic and enduring design of the OMEGA Constellation is characterised by its famous half-moons, “claws” on the case and mono-rang bracelet. This 25 mm 18K Sedna™ gold and stainless steel model features a diamond-paved bezel, crystal white silvery dial with diamond hour markers and scratch-resistant saphire crystal. The hands, OMEGA logo, Constellation star and diamond holders are also in 18K Sedna™ gold. At the heart of this timepiece is the OMEGA Calibre 4061, while the caseback is stamped with the Constellation Observatory medallion. The dramatic and enduring design of the OMEGA Constellation is characterised by its famous half-moons, “claws” on the case and mono-rang bracelet. This 29 mm 18K yellow gold and stainless steel model features a diamond-paved bezel, pearled mother-of-pearl dial with diamond hour markers and a date window at the 6 o'clock position. The hands, OMEGA logo, Constellation star and diamond holders are also in 18K yellow gold. At the heart of this timepiece is the OMEGA Co-Axial Master Chronometer Calibre 8700, visible through the domed scratch-resistant sapphire crystal. The dramatic and enduring design of the OMEGA Constellation is characterised by its famous half-moons, “claws” on the case and mono-rang bracelet. This 25 mm stainless steel model features a bezel engraved with Roman numerals, white mother-of-pearl dial and scratch-resistant saphire crystal. The hands, OMEGA logo, Constellation star and indexes are in 18K white gold. At the heart of this timepiece is the OMEGA Calibre 4061, while the caseback is stamped with the Constellation Observatory medallion.